louisgray.com: What If We Redid the 2000 .Com Monopoly Edition for Today's Web? 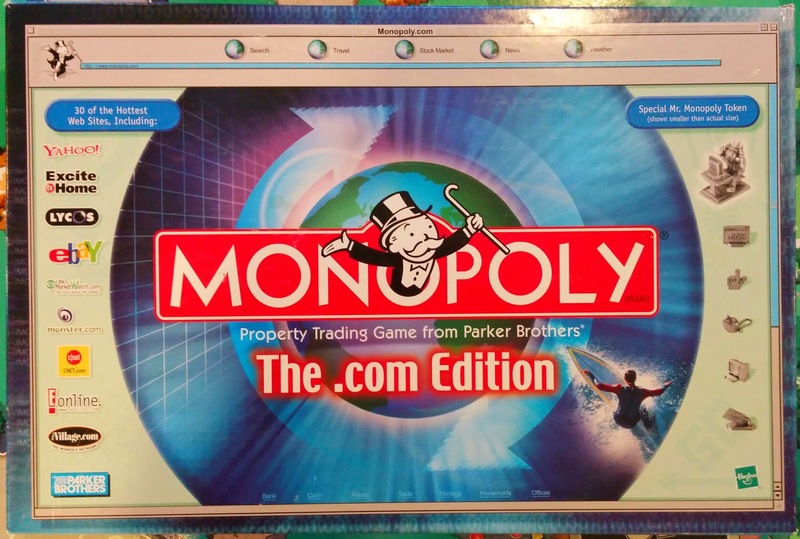 What If We Redid the 2000 .Com Monopoly Edition for Today's Web? In the year 2000, as the .com bubble was at its peak, it seemed new tech names were going to rapidly eclipse the old guard. Emails and downloads were new conversation topics, and if you weren’t still on AOL, debates would ensue over which ISP you should choose, or which search engine or portal was the best. Sun was the dot in .com and Linux seemed poised to take over the desktop. Obviously, not everything turned out that way, even if some of the names are still around, and even strong. One of the fun collectibles that came out of this time was a .com edition of Parker Brothers’ Monopoly. Instead of properties around Atlantic City streets, you had websites. Community Chest and Chance were replaced with Email and Download cards. And you couldn’t buy property for a few hundred bucks, as everything was in the millions of dollars. Not too soon after the game came out (and of course, I still have it), the .com market was decimated, as the companies of the future weren’t built for the present. Now the game board itself looks like a relic of a short-lived era gone by. As something of a lark, and thought exercise, let’s consider who would take these 2000 era companies’ spots on the board. I’ll go first with my take on today’s cast of characters. Commentary: The 2000 edition definitely had a bent toward community. With iVillage and Oxygen, two of the three properties were focused on women. GeoCities didn’t age well and was retired. Pinterest, SnapChat and WhatsApp have become some of the fastest growing communities for pretty much all ages and both genders. Commentary: Shockwave? Really. Let’s move on. For fun entertainment and burning hours of Web surfing, TMZ, Buzzfeed and Reddit can’t be beat. Reddit is a tough one to categorize, as it calls itself the Web’s front page, but it’s knocked off Digg, Slashdot and others for that title. Commentary: eBay could easily be a repeat in 2000 and 2014. Priceline and Expedia are still doing fine. But Square and PayPal are how the Web does business these days, while Yelp is often the place to go for recommendations on what to buy or where to go. Commentary: Monster.com and eTrade were monsters in 2000. I still use eTrade regularly, but they’re not known for their monkey-centric Super Bowl ads any more. Marketwatch is a snooze. Now, people get their financial and business data from each other via LinkedIn, in real time on Twitter, and check its veracity on Wikipedia. (Apologies to Seeking Alpha and StockTwits). 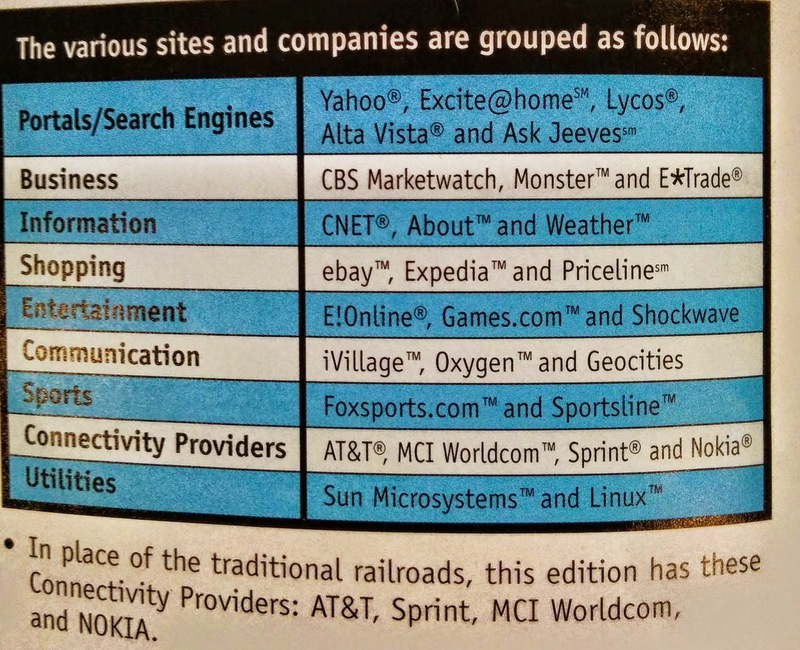 Commentary: In 2000, Search engines took the entire final row of the Monopoly board. But the positions of Alta Vista, Lycos and Ask Jeeves weren’t strong against innovators that got stronger in the next decade. Now, diverse infrastructure plays like Microsoft, Amazon and Apple (for many reasons each) occupy this highly valuable section of the board. 2000 .com Monopoly edition: Excite@Home and Yahoo! Commentary: That Yahoo! was the Boardwalk of 2000 is telling. Excite@Home was a $6.7 billion megamerger in 1999, but by 2001 was pretty much in steep decline. Without intending too much bias toward my current employer, Google and Facebook are the 1-2 when it comes to the Web today, from the top destinations to hours spent, tools deployed, etc - and both play a role in discovery for everyone. Commentary: Worldcom? Whoops. Nokia? Whoops. Things change, and companies don’t always adapt quickly. The megalopoly of AT&T is now most like Comcast’s ISP/cable monolith, and Verizon (including their FIOS offering) is the big carrier to be dealt with. Fighting the good fight, and using a ton of bandwidth in the process are Netflix and YouTube, which are essential media mediums on every device. Commentary: We’re still waiting for the year of the Linux desktop, and Sun is now somewhere in Oracle’s beautiful campus. But while you could take a stab at a language or a platform, like Python, Ruby on Rails, or even PHP, generically its best said that the storing of data and access to that data are the true utilities of 2014. Pervasive WiFi (or 3G/4G) and Cloud power every app and every site. Summary: The Web is dramatically larger, and more global, now than it was less than two decades ago. 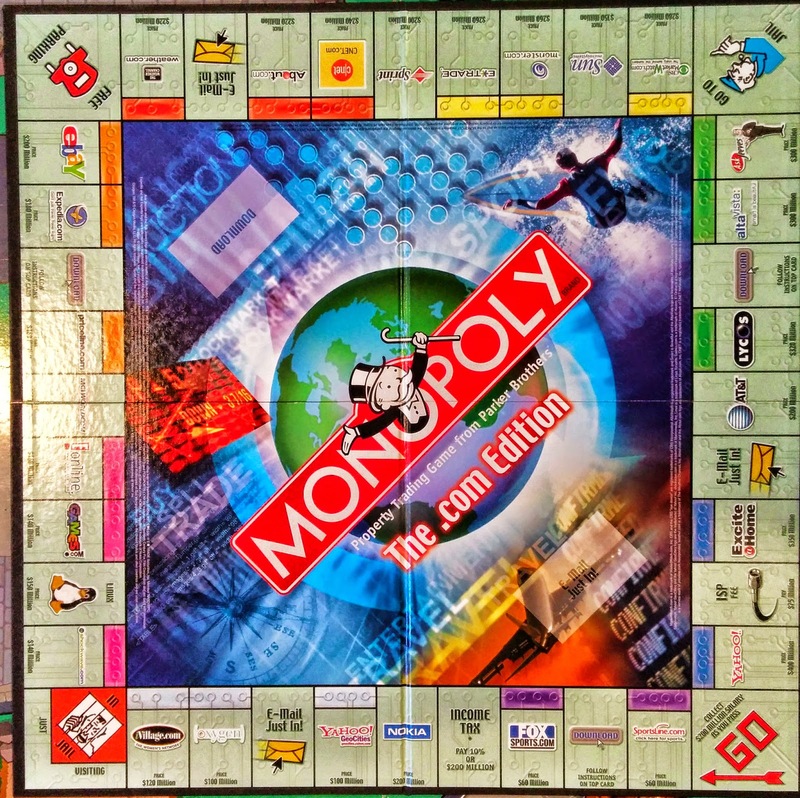 This admittedly English-first version of the .com Monopoly for 2014 misses out on the international communities like Baidu, AliBaba and others. There’s no place for the Uber and Lyft rivalry, and while Tumblr was included, it’s hard to put Yahoo! on the board, which probably isn’t 100% fair. I wanted to find a spot for Spotify and Hulu, but failed. I’d be ecstatic to see if Parker Brothers was up for another run at the web centric board, and you know I’d buy it. Disclosures: I work at Google, which is a customer, partner and competitor with many of the names on this board. Putting them on a Monopoly board is not an opening for the company (or any other on the board) being a monopoly joke.